Teaching about character traits is fun. Students enjoy learning new words to describe people, and the subject lends itself to lots of interesting activities. Here are a few things that I've been doing in my classroom in the last two weeks. Read aloud: I started the conversation about character traits by reading aloud to students and doing a simple 3-column chart (character, trait, explanation). With one class, I'm reading There's A Boy in the Girls' Bathroom. The first chapter of this book introduces us to Bradley, and even my reluctant readers are riveted! Louis Sachar uses both direct and indirect characterization to tell us about Bradley, and we can make inferences about his traits based on his actions, his words, and what others say about him. With my other class, I'm reading Frindle. (I just can't stand to read the same book to two classes at a time!) In this book, Andrew Clements uses the first two chapters to introduce the characters of Nick and Mrs. Granger. It's perfect for using character traits to make predictions about how characers will interact. Dialogue based on traits: I have a very dramatic class this year! They love to create and perform skits. After we talked about character traits in read aloud, I gave groups of students a list of characters and traits. (Example: Maya=studious, Andrea=carefree) Then, the group worked together to try to create a skit that would show the traits. For fourth graders, this was a difficult task. As we performed the skits over several days, however, their guesses improved. Students refined their thinking from just saying "nice" to saying "thoughtful" or "considerate". Character traits in a shared reading: The big message throughout my lessons, of course, is that we need to make inferences about a character's traits. We looked at how we could infer a character's traits through their thoughts, their words, and their actions. In a shared reading, students worked to identify traits for different characters. We used the same chart as we had for the read aloud. How traits change: With about ten minutes of reading a day, after a week we reach the part in the book in which we start to see characters changing. One boy today said, "Wow--we're really seeing another side of Bradley." For fourth graders, who are emerging from seeing everything as all one way or all the other, this new dimensionality is crucial. No one trait can describe a character, just like one trait can't describe any student. One of my favorite kinds of stories is the story told through letters or documents. In these stories, a reader needs to piece together the details from the letters to figure out how the story is unfolding. These kinds of stories are great for students who are learning about making inferences, as they will be able to practice reading beyond the text to determine what is happening. Next week, my students will read several stories told through letters. As I've taught these stories before, though, I have found that students have trouble putting them together. I decided to introduce the idea by showing students some letters and having them try to figure out what is going on. But where to get the letters? As I was thinking about this, I realized that I happened to have just the thing. Several years ago a friend of my father-in-law's gave him a stack of old papers from an auction. We spent an afternoon looking through them, doing just what I want my students to do--figuring out who was writing, why they were writing, and who they were writing to. Why should I scrounge for new letters? These would be perfect. -What inferences can we make? -It was difficult to read the cursive of long ago! Some of the documents had the f/s switch, which made it even harder. I reminded students of the cloze passages that we had done several weeks before. -Students were quick to jump to conclusions, often from a lack of background knowledge. "I think this is about a crime, because it has pounds of silver on it," one boy said. After I explained that this was the currency used in 1811, they examined the document again. When it was time to share with the class, they showed a place where careful sums had been worked out in pencil. "This isn't about a crime, but about how much the one guy owes," the student said. "Here it shows the subtraction problem that he did to find out how much more he had to pay." -Students made many inferences that related to their background knowledge. "It says here that he needs to pay $30. Back then, that must have seemed like $100!" one student said. The idea that things were cheaper long ago was well-known to students, and they looked for details that connected to this. -Students weren't satisfied with sticking with one document. They were fascinated by what other people were finding and wanted to roam around looking at more! Dear Mrs. Larue: Letters from Obedience School: This book is amusing because what the author of the letters is saying is quite different from what is really happening. The Gardener: These Depression-era letters tell the story of a girl who goes to live with her uncle in the city. The Journey: Also by Sarah Stewart, this story is told through letters from an Amish girl who visits Chicago. Letters to Mrs. Roosevelt: This is a great collection of letters written to Eleanor Roosevelt during the Great Depression. Early America: This site, while it does include advertisements, also has many links to online newspaper articles, documents, and other interesting tidbits. After their desks are ready, students move to the back of the room. I pull popsicle sticks (my favorite classroom management routine--popsicle sticks with every student's name!) and tell students where to sit to start. Then, they silently move around the room, reading what other students have done and writing their comments. At the end of the session, students return to their own desks and read what others have written about their work. When students do this for the first time, it's important to model respectful, polite commenting. I usually don't introduce this until my students are well-practiced with oral sharing and questioning, and we've had many opportunities to share our thoughts. I tell students, "Don't just say that you liked it. Tell the writer what you liked!" I'm always surprised by how many of them complain about the handwriting of other students. I tell them, "Let the writer know that you had trouble reading their writing, but try to comment on what they were saying as well." With our bubble poems, I took this sharing another step. Students started by thinking about what they wanted someone to notice in their poems. They had been working on using different kinds of figurative language, so many of them wanted their readers to notice how they had come up with an interesting simile, or used personification to show what bubbles are doing. Then, I told students that they would have to use specific details in their comments. Just writing, "I liked your personification" was not enough. What was unique about the personification? What made this piece of writing stand out? It worked quite nicely. I was able to wander the room as well, adding my own comments to the mix. One student wrote, "I like the bursting volcano simile that's a comparison I never thought of. Cool!" Another wrote, "I love how you made the bubble the narrator." After students returned to their seats and read their comments, we talked about the process. Many writers were glad that their readers had noticed what they had wanted them to notice. This was great! But some also had some unexpected surprises. "They noticed things about my poem that I didn't even notice," one writer said. "I didn't know that everyone would like my pictures so much," said another writer, who had illustrated her poem with careful, intricate pictures of each simile. Another one said, "I think I need to rewrite my poem. I don't think that anyone got it." Giving students a chance to share and get feedback in a calm, low-risk environment builds our writing community. Students get to hear what other people think about their writing, and they can use this feedback to inform their future writing. One of the biggest challenges that I face as a writing teacher is how to structure the pace of the class. How can I keep things moving, but still give students time to explore and revise? How can I give students plenty of time for writing, but still teach standards-based lessons? How can I focus my time on providing the feedback that matters? How can I ever get anything done? Well, I don't have all of the answers, but I have found some routines and procedures that work for me. Quick writing conferences: Students don't read what you write on their papers! I remember feeling a sense of irritation as students looked at their graded work, squinted at my carefully composed comments, put the papers aside, and merrily continued writing in the same way. My written comments didn't mean much to them. But our conversations have meaning. When we talk about a piece of writing, I can ask questions, give input, hear the student's point of view. Sometimes our conversations lead to the student realizing that more is needed. As one boy was reading his poem aloud today, he stopped and said, "You know what? I'm having trouble reading this. Let me go back and work on it some more." Wow! This was so much more worthwhile than if he had just handed in his poem and I had written comments on it. I don't have a special conference place, as some teachers do. Instead, I wander the room. Sometimes students raise their hands or come over to see me, but sometimes I just drop in on writers. As we talk about a piece of writing, sometimes neighboring students will chime in and offer their comments and viewpoints. We start chatting about the piece of writing, and the whole process becomes relaxed and fun. Usually our conferences are fairly short, just about 3 minutes or so. Student writing coaches: I have also realized, though, that there are times when my voice is not what students need to hear. Then I call for a writing coach. "It seems as if ___ needs a writing coach. He's trying to find an ending point for his poem about bubbles. Is there anyone who can work with him to do this?" Then I allow the student to choose his writing coach. With fourth graders, I always give the writing coach a very specific task--not "Work on this piece" but "Find other words for twirl." The best writing coaches are not always the best writers. Often, it's best for students to work with another writer who has struggled with a problem or worked on a detail. Meaningful, worthwhile background work: The key to making it all work is the journal writing that I started way back at the beginning of the year. Students always have something else that they can be writing. This way, when they are finished with a project, they can drop back into their journal writing. Some students have long stories that they have been typing on the computer for weeks and even months, taking time whenever possible to add to this relaxed, no due-date work. Reading what others have written is another great option. By this point in the year, I've accumulated several binders full of finished stories, poems, and reports that students have written. They love having the opportunity to read and comment on their classmates' work. "Mrs. Kissner, look at my poem!" For a long time, I was tongue-tied when students brought me their poems. I just didn't know what to say. Like many teachers, I was worried that my comments would somehow stifle their creativity. I didn't want to be the mean teacher who ruined a student's love of poetry. But a lame, non-specific "Great job!" doesn't work very well, either. What about the poem is great? The fact that the child was able to put some words on the page? The fact that the student spent five minutes engaged on a task? If I don't know what was "good" about a student's piece of writing, chances are the student doesn't know either. As I read students' poems and talk about them, I usually keep these questions in mind. What is the main point of the poem? Often, some kids will start out by writing poems with nonsensical rhymes: "Bubbles, bubbles, like to fly,/ Bubbles, bubbles, in the sky./Now I pop./Goodbye!" These writers think that the rhyming is the essence of poetry. For these writers, lots of hands-on, concrete experiences will help them attune their senses and get them writing about what they really see, instead of what they think they should write. In the past few weeks, I've had good luck with writing about tadpoles and bubbles. -Tell me about your rhyming words. Why did you choose them? -What are you telling the reader? -What are you saying that the reader doesn't already know? -Try observing ______ again. Write down all of the words that come to mind. How does the poem look? -How is your poem different from this one? -What can you do to make this look more like a poem? -Which words should go on lines together? Which ones should be apart? Which parts are the strongest? Many poems are of varying quality--there are parts that are strong, and there are parts that are not as strong. I've taken to circling the really great parts. "I love this image/idea/personification," I tell the student. "How could you make the rest of the poem just as strong?" Today, one student was writing about a bubble popping. She ended her poem, "I pop. Goodbye!! :)"
I said, "Do you think the bubble would be so happy about popping?" She went back to her seat, thought for awhile, and added a word: "I pop. Sigh. Goodbye." I said, "What a great change! Just one little word gave the whole line a different feeling." -Which part of the poem do you like best? What do you think your readers will like best? -How can you make the middle part stronger? Often, it's the ending that trails off into nothingness. Students have an idea of how long the poem needs to be, and they write empty words to fill up space. For these students, I'll say, "I think that there's a place where the poem needs to end. Can you find it?" I said this twice today, and each time the student knew exactly where the poem should have ended. -Do you think there is a better ending? -How can you leave the reader with a really strong thought? -I think your ending needs work. What can you do to make it better? I love that my students are playing around with speaker. They are using different speakers in their poems, adding dialogue, showing different points of view. But sometimes they are so excited that they lose their focus. Today, I read several poems that abruptly changed speaker midway through. These changes were distracting and confusing to the reader. -Who is the speaker in your poem? Is it the same the whole way through? -How is the first part different from the second part? -Where do you think a writer might get confused? Well, it was a rushed morning, filled with lots of ideas and writing (and bubbles! ), but it was productive. With some strong comments, I could guide my students toward writing even better poems. We're making a big shift in my classroom, a shift from working with text structure to working with making inferences in fiction. I love talking with kids and listening to them talk about what they are thinking at different points in the text. Why is it important for a reader to be able to infer a character's emotions? This is one of those topics that is on state tests and standards, but really deserves to be taught and taught well. Understanding how someone else feels is a key to understanding and loving literature. This is what reading is all about! For my fourth graders, being able to infer someone else's emotions will help them to be able to navigate the interpersonal relationships that will become more and more important in their young lives. To get started, I needed to find out what my students already know. This is our state testing week, so another test was certainly not the way to go! Instead, I called up groups of students to act out short scenarios. They loved this part. Then, we talked about the situation and how the character might be feeling. I encouraged them to use the inference equation from The Comprehension Toolkit: Background Knowledge + Text Clues = Inference. What did I learn from this? My students were able to use their background knowledge to make inferences. However, their inferences lacked subtlety. Now came the time for teaching. "Do you think that these events are all the same?" I asked students. "Do you think that you'd feel the same way if you dropped your ice cream as you would feel if someone wrecked your car?" They knew that the feelings would not be the same, but they didn't have the range of vocabulary to express the differences. They were ready to learn some new words. I called up six students and gave them each a word on a notecard. "Each of these is a word that is related to angry," I told students. "But some of them are stronger feelings than others. Try to line yourselves up from the least intense feeling to the strongest feeling." It took some prompting from the rest of the class, but finally they did it: annoyed, irritated, exasperated, mad, upset, furious, livid. (Of course, there are lots that you can add, and there is some wiggle room in how you arrange them.) Then, students copied these words onto a piece of bright orange paper to put in their reading notebooks. "Let's go back to the situations that we looked at earlier," I told students. "Are there any more descriptive words that we could use?" Now the conversation became lively as we discussed the difference between irritated and exasperated, the difference between furious and upset. Timing is key in this lesson. If I had just started out with teaching the words, how might things have progressed differently? I know from experience that students look to the new emotion words much more passively. They don't see the need to know them, so they don't work to learn them. By showing students how their current language just wasn't enough to express what they wanted to express, I gave them a reason to learn new words. After doing the same procedure with Scared Words, we were ready to move into text. I had pulled Eve Bunting's How Many Days to America? from the bookroom to use with this lesson. I modeled on the first few pages, and then students read in small groups, charting character emotions along the way. "Can we do this every day?" one student asked, walking out the door. I have to admit--acting out the situations was fun! Another student, the one who played the part of the father in the car wrecking scenario, stopped by the door on the way to recess. "Mrs. Kissner, I have another feeling," he said. "I'd also be relieved, even though I was furious, because I'd be happy that my daughter wasn't hurt." Helping students to make inferences about a character's emotions is not only fun, but rewarding. Give it a try! Two weeks ago, I brought in a mass of unknown eggs to the classroom. For the first few days, we thought they were salamanders. Then, they hatched! We found out that they are actually wood frog tadpoles. Their gills were on the outside at first, but are now inside. I like having the tadpoles in the room. They are the launching point for some great learning opportunities. Here are my favorites! Tadpole personification: While learning about personification, students observed the tadpoles and tried to write about what they were doing using personification. We had fun trying to think about how to describe what they were doing. Many students thought of them as running races, playing tag, or even playing hide and seek. Tadpole census: After a lesson from our guidance counselor about the census, several students undertook a tadpole census, counting the numbers of tadpoles at different stages in development. Tadpole drawing: I have a LONG arrival and dismissal time to fill--about half of my class comes in 15 minutes before the rest, and stays 20 minutes later. It's hard to find productive but engaging activities for students during these times. Luckily, the tadpoles are very motivating for the students! Students have been drawing pictures of the tadpoles each day. I've been amazed to notice how the students' pictures have changed throughout the weeks--they have improved at how they were representing the tadpoles and the level of detail that they used. At some point, teachers need to know: What do students know? What can they do independently? What do they still need support to do? There are several ways to assess student use of text structures. Each of them can help a teacher to figure out where students area and what the next steps for instruction should be. Graphic organizers: As students read expository text, you can learn a great deal by observing how they interact with text. Can they complete a graphic organizer to represent the ideas in the text? If not, the student might be struggling with the thinking that underlies the structure. You may want to see if students can do the kind of thinking outside of text. For example, if the student is having trouble with completing a graphic organizer that goes along with a cause and effect text, you may want to try some work with cause and effect in pictures. Given a choice of organizers, can they choose the one that best fits the text structure? This shows a deeper understanding of how main ideas and details work together in a text. Hint: If a student chooses an incorrect graphic organizer (for example, trying to represent details from a text that is description with a chronological order graphic organizer), resist the urge to correct the student immediately. Often the problem will become obvious after a few sentences, and the student will be able to figure out how to fix the problem. What a great lesson this becomes! Individual paragraphs: Observe students as they read paragraphs and try to identify the text structure of each. Are they able to do this? While this is not really authentic reading, it can tell you about what students are thinking as they read. 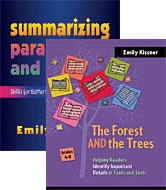 Longer texts: Assessing student use of text structure in longer texts doesn't have to mean a long, drawn-out assessment. Try putting questions about a longer text on the overhead and having students go back to the text to find the evidence to support their answers. Then watch them carefully as they start to look! For example, if the question about a problem and solution text is, "How can you try to solve the problem of invasive plants? ", a student with a strong knowledge of text structure will know that solutions are probably found later in a text than problems. A student who starts at the beginning to reread the entire text, on the other hand, probably has a weaker understanding of text structure. Why is ___________ a problem? How was the problem of __________solved? How is _______ like ___________? Probably the best way to see how kids are understanding text structure is to watch them in their authentic reading. Readers rarely stop to consider the text structure as they work through a text. However, students who understand text structure can use the structure to find the information they want. Last week, several of my students worked their way through a tricky compare and contrast paragraph in a field guide as they tried to figure out if a pond bug was a backswimmer or a water boatman. "They both look so much the same," one student complained. Another student took the field guide. At the bottom of the page was a lengthy discussion of how water boatmen and backswimmers are similar and different. "Yeah, but look at what it says," she said. "The water boatman swims upright, but the backswimmer looks like it's upside down. We definitely have a water boatman." This is what we want for my students--to be able to use text structures to help them understand the world.